(Bloomberg) -- The clock is now ticking for Elon Musk to avoid a $920 million bill for Tesla Inc. Some analysts still doubt that’s plausible. 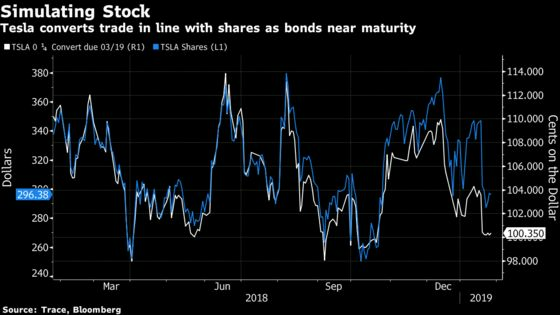 Tesla could end the year with around $2.6 billion in cash, including an additional $2 billion in outside capital UBS Group AG analyst Colin Langan expects to be raised in 2019. The capital will be used to support the Model 3 ramp, construction of a factory in China, and planned production of the Model Y and Semi in 2020, according to a report Monday. He has a sell rating on the stock, and lowered its price target to $220 from $230. 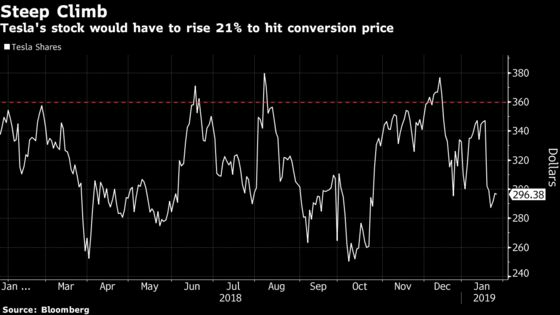 The start of 2019 brought a spate of bad news that’s sent Tesla shares down more than 20 percent from their December high, to about $296 at Monday’s close. Musk announced plans to lay off 7 percent of Tesla’s work force, warning “the road ahead is very difficult” for making its Model 3 sedan more affordable for the masses. The company has cut prices and production on some of its vehicles. And trade tensions with China have yet to improve.